Well I took her out for shake down and fished her a few times and everything seemed to be working well. As I was returning to the ramp I heard some motor noise and felt a loss of power. Bad gas? Fouled plug? Well I took her in a 22' 1980 Almar jet sled. 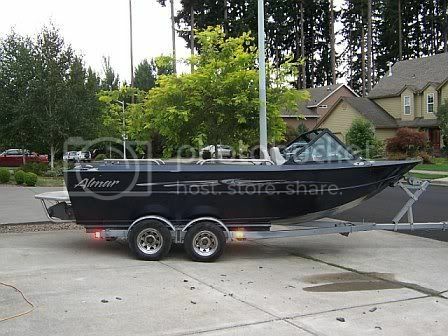 Monster of a boat made of some seriously thick aluminum quater inch everything, high sided and very durable. It is a great fishing boat and I have even taken her 50 miles out of newport chasing tuna. Well my mechanic called me today after he had a look and said "are you sitting down". He told me that there are copper flakes of metal in the oil and that the motor needed rebuilt. I confirmed this when I arrived. $5000.00 bucks and you will be back in the water . Well this hit my kind of hard as next week I had been planning on taking her out to Astoria for a week as I had some work to do there. SO I need you guys to help me decide what to do. Should I have it rebuilt? Should I buy a new motor and install it my self. Need some advice. The motor I have is a 454 and is a little aggressive on gas consumption, considering putting in a smaller motor like a new 350 fuel injected? Would your pump have to change also? Money is always a factor and wife wasn't at all happy that "we" need a new motor !! ...well the one I would want.....let me know if you guys have suggestions. Re: The Worst news for a boat owner "blown motor"?! I've had rebuilds that needed additional rebuilds in short order. I vote new motor. 350 will be your most affordable crate engine- my 20 footer has a PFI 350- MUCH snappier than a carb motor. GM is also now offering a 6.0 or 6.2L that is FI and its 400 hp!!!!! bETTER yet, its an aluminum and over 112ls lighter. BAD NEWS, it will run you more than 5K, BUT tell the MRS. tha its cheaper than 40K . Its eaiser to ask for forgiveness than ask for permission . Those copper flakes are your main and/or rod bearings. Bummer. The quickest and cleanest solution is a crate motor, but it'll probably run you close to $5K not including the labor. You can get cheaper ones, but they won't be suited for marine use. IMHO, try to find one with a steel crank and rods rather than cast, and with 4-bolt main caps. Fortunately, it's a BB Chevy and there's no limit to the trick options out there (well, there is a limit, it's called money). I will be having the same issue soon. I have a 454 that has 2300 hrs or so on her. She runs good but is getting tired. I have been thinking about rebuilding her myself or having a mechanic do it. Crate motors are a good idea too. What a tough decision. Just because there is some bearing material does not mean that it needs a complete rebuild. Best thing would be to pull it and flip it on an engine stand and check the bearings and crank for wear. The only motors that have been rebuilt that need another rebuild...well you need a better mechanic and machinest. Yeah, the question would be how far the material migrated through the engine. And one good thing is that copper is pretty soft, and hopefully the oil filter wasn't overwhelmed. But if you heard noise and lost power, it sounds like a partial meltdown. If you're lucky, you might get away with a crank kit and an oil pump, and don't ignore the big end of the rods. If you spun a rod bearing, you're gonna have issues if you don't resize 'em. Same with the mains. The block may need a line hone. I had a cam go flat in my 351W last fall. I was going to just put a new cam kit in it, but on the advice of my machinist I pulled the engine and took a peek in the pan. He was right; the engine was full of cast iron sand from the destroyed cam and lifters. It went everywhere and wiped out the bearings, crank, and generally polluted the rest of the engine. It sucked, but I'm glad I didn't ruin another cam and waste a bunch of time before I figured it out. I was an engine builder back in the early to mid 90s. My shop built auto and marine engines. Diesel and gas. A quality shop and machinists can do an amazing job with may I emphasize. GOOD CORES. And in my opinion you will end up with a great engine that will serve you for years to come. I dont have access to any of the equipment anymore so when I take my stuff in. I interview the machinist. If they dont know at least what I knew back then.....? I keep shopping. A crate motor will generally come with a good warranty and is a pretty cost effective option. The Warrior merely carries the sword on behalf of others. His task is a lordly one because the Warrior still agrees to die for the mistakes of others. You shouldn't have to change your pump. Unless of course you want to improve your performance even more. I assume you have the old Hami 773. The newer pumps are awesome, but costly. By the time you got into the pump and motor it would cost you 12k. I also have an Almar. 1978 Jetline I spent the last couple of years refurbishing. It has a Hami 212 and Ford 502. WOW your Almar looks awesome. I have the exact same boat, but all aluminum no paint. That really looks sharp! How big is your jetline? Well I have decieded to pull the motor my self and take it to a machine shop and have it totaly redone. When you can litterly be betting your life on the motor you just want it done right. If I pull it and take in they are going to charge me 2500.00 for the complete rebuild. It sound reasonable, any sugestions on parts I should use or different things I should have done while in the machine shop? Thanks for all the input, I am trying to get this thing back in the water ASAP so I have already got the motor out. WHich seemed pretty easy, I labeled all the parts and connections and video camered the removal for reference after I get it back. I will keep posting until I am back on the water. Thanks again. I'd strongly suggest having it balanced. It'll live longer and run smoother. And make sure they Magnaflux everything, especially the crank and heads. It may have a cast crank (most 454s do) and they're not real strong. I once watched a guy I know snap the snout right off of one when he used an impact wrench to tighten the balancer bolt. Oopsie. A steel crank and rods would be the way to go, but that would add some serious coin to the job, and you should be OK with the cast as long as your not going for major pony power. And look at the bright side- $2500 clams would barely make a dent in an outboard rebuild. We all know how it goes...I got the motor out and now I kind of just want to replace every single part I can, fuel pump, water pump, alternator...makes sense right? I have a Hami 773, I think..I can't find any number on it that would give a guy a clue. My question is should I do do jet/impeller work any upgrades that can be done to increase performance/efficency? When I free spin my pump now that the motor is out I hear noises that sound like "squeaky rubbing noise" like there is sand or something else in there? Any thoughts? I would take that repowering as good news. Id pick a modern fuel efficient motor and thank my lucky stars she didnt blow 30 miles off shore. A couple years ago , It shouldn't cost ya anymore if you swap out w/ another 454, Just shop around really good.---Good luck. The big thing is having trust in your machine shop. The 60's and 70's are gone and there is getting to be fewer guys that really know what they are doing out there. It sounds as though some here have connections to some good shops. Thats good. Crate motors have come a long way from their first offerings a few years ago. Cost effectiveness of these is either a push or cheaper in a lot of cases nowadays. GM and Ford both still make most v-8's blocks NEW for these motors and have a LOT of different ways to order them. Hell, you can get a 350 5.7L in anything from 250 to 500+ horsepower depending on how much $$ you want to spend. THE BEST part of this deal is you are not dependent on the Machinist to recomend the proper components to get you to the Horsepower you want. Also, the failure rate on GM factory crate motors is less than .04% according to GM. For Me, i dont know a good shop so if it were me, a cratre motor with a waranty that was redeemable almost anywhere would be my call. Less hassle in less building a motor is what your into. And it may be.. The big thing is having trust in your machine shop. The 60's and 70's are gone and there is getting to be fewer guys that really know what they are doing out there. No kidding. The PERs (production engine rebuilders) have taken over much of the market and driven a lot of machine shops out of business. There's a few good ones left, but they're mainly in niche markets (antique, racing, heavy duty, etc) and they have plenty of work, so you can expect a long wait and a hefty bill. Go buy a wrecked GM Duramax pickup and throw the motor in. It would more or less bolt in, have much more power (again, only limited by $$$), and would be very fuel efficient. You can pick the trucks up for $5000 on up. "Dont under estimate the power of people to disapoint you"
"Trust but Varify.." Ronald Reagan. Part time Motivational Team Leader and Life Coach. That swap is not practical for most people. The smallest jet drive that I know of that has the impeller options and size to hold that motor back and is designed for the rpm range of the motor is a Hamilton 274, which is around a $15k pump and is designed for larger boats. Also the Duramax is a heavy motor like the Cummins 5.9L which are around 1400 lbs marinized. I know this because I looked at these options when having my current 25ft PWeld built this winter. Pay the 5,000$ and you have a new boat! Make sure that you follow your engine builders advice on the ol in that 454. I presume that it's a flat tappet cam. Todays oils are made for roller cams and the ZINK had been reduced so much that they will not protect a flat tappet cam. Especially in a 454! You will want a Diesel oil like Dello 400 or an equivilant like Rotella. I would use the Rotella synthetic if it were me after breakin!. My goal in life is to leave the largest carbon footprint that I posably can! I've rebuilt a few. You really have to be diligent and have the core checked out. Overheat and cracking are issues on marine motors. So a clean bill of health on that score before you plow the new stuff in is a must. The guy I use is in Beaverton. He has built 3 for me now and all of them are great motors. I passed this info to a friend who had that shop build a 454 like yours. It lasted only 1 season. Don't know what went wrong. But now I am rethinking the whole DIY I/O motor repower thing. Crusader makes awesome new motors with a good warranty. KEM in Tualatin is another source. Check fuel tanks and cooling system while the boat is in overhaul. Remove and clean the tank if possible. Replace all the fuel lines with new alcohol proof USCG rated lines. Check your cooling water pump, pickup strainer and hoses. This the best time for that. Also mount anything that you can't get to with the motor in the way. I added a bilge pump under the oil pan to get that little bit of water that sloshes around by my flywheel out of the boat so it will not sling around and rust stuff out. Oh and if you don't already have one check out the remote oil change kit. A hose that runs from the drain plug on the pan. Just push this out the garboard drain and hang it over a milk jug to change the oil quickly. A steal at $30, made by ITT. You will love the way your new motor runs. Well worth the money spent. Try a 100 hours... broken intake valve = $15k+ down the toilet. IMHO, you are taking chances on a lot of shops unless you Really read the fine print on a warranty. With a Factory GM, Volvo, Crusader, or any of the crate motor MFG's you get protection and the HP you want. Building or Rebuilding a motor is like baking a cake. I want the chef that knows what ingredients to ad . Update....Thanks for all the input, especially as I will be breaking in a newly re-built one very soon . After alot of research I deceided to take my motor to NAPA machine shop in Bend Oregon. Every mechanic I talked to in our area said they were the best. NOt the fastest but the best equipment and the best warranty. 3 year unlimited hour warranty that covers parts and labor. For the complete rebuild it is going to run 2800.00. I am going to replace fuel pump, water pump, alternator and I already have a new starter so it should be pretty good when I am done. I will pull out one of my gas tanks as I do believe that was the initial part of my problem. I had bad gas in one of my tanks and was told by my mechanic that it was fixed and running well. At pretty much full throttle I switched tanks and bam......here we are....coincidence? I don't think so but...who knows. I should be up and running again soon....want to break it in right any suggestions on how to do it right? change you oil at abot 10 hrs. Vary the rpms. Use a good filter. WIX makes a goos one..